Search for scattered secrets and the key component of a mysterious machine. "Loved this Mortimer Beckett game. Lots of levels and mind challenging puzzles. Never a dull moment. I want more!" Search a spine-tingling setting for scattered secrets, broken objects, and the key component of a mysterious machine in this immersive investigation. After receiving a letter from his Uncle Jerome about a strange device, Mortimer sets off on a seek-and-find adventure in his Uncle's strange home. 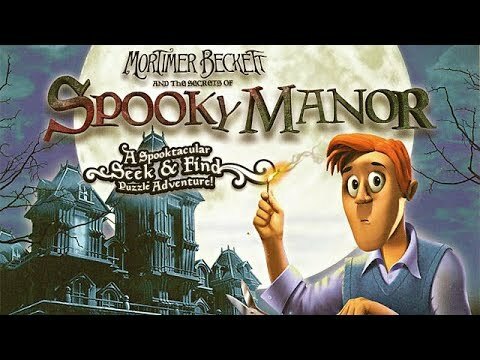 Hunt the halls of Spooky Manor, and solve a series of brain-bending puzzles to get to the bottom of this eerie mystery. This game is great -- highly addictive and once I started playing, I could not stop! Awesome plot and characters and I absolutely love this game. All the Mortimer Beckett games rock so keep them coming. I can't get enough of them. I have played them all. I loved this game. The puzzles aren't hard but it kept my interest. I look forward to more Mortimer games.